An outdoor kitchen gives any outdoor living space a refreshing new meaning. Aside from being an additional dining area, an outdoor kitchen can also be fitted with grills, ovens, cupboards, and even a bar. Grills remain to be one of the highest requested features for outdoor kitchens that we have installed. 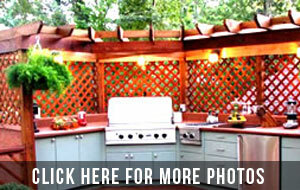 Patio Creations provides custom, semi-custom, or prefabricated grills to complement your outdoor kitchen space. We can also construct a wood-fired outdoor pizza oven upon request. During our design consultation for your own outdoor kitchen, we will discuss whether you want any additional features such as refrigerators, sinks, countertops, cabinets, or trash bins. Whatever specifications you have in mind, we will find a way to include them and still stay within your budget. For a more comprehensive consultation, send us a message today or call us to schedule a free in-home estimate and consultation!